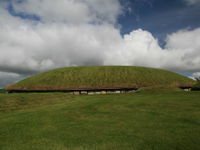 County Meath is situated on the east of Ireland, to the north from Dublin. Most of its lands lies inland, only the small part has access to the Irish Sea. 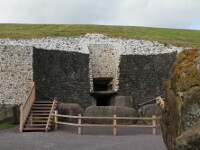 Thanks to very fertile soil of the Boyne River area, the first people settled here over 5000 years ago, and many of the structures they built survived until today like for example passage tombs of Bru Na Boinne (Newgrange, Knowth and Dowth), which is Europe's largest and most important concentration of megalithic art (designated as a UNESCO World Heritage Site). 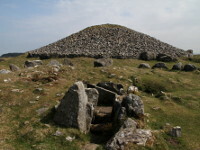 Less known, The Loughcrew Passage Tombs (Sliabh na Caillí) complex is another very important and interesting Neolithic site located in County Meath. The next site of huge historical importance, associated with many irish legends is The Hill of Tara, seat of High Kings of Ireland, which prospered until 10th Century. 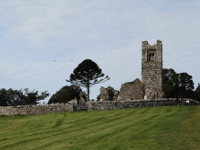 County Meath has been also associated with Christianity in Ireland since its earliest days. The legend says, that the Hill of Slane was a place where St.Patrick challenged the Druids and lit first Paschal fire in Ireland, in 433 AD. The Kells Abbey, founded around 800 A.D is famous for the four-volume, illustrated, manuscript of the Gospels, The Book of Kells ( which it is on permanent display at Trinity College Library, Dublin). 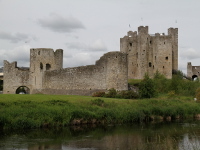 Among historical monuments of architecture in County Meath you will also find the largest Anglo-Norman fortress in Ireland, Trim Castle. 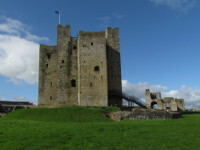 Battle of the Boyne, which took place across the River Boyne near the town of Drogheda in 1690, raises the historical significance of County Meath. Here, William III defeated forces of James II, what meant the end of Catholic Ireland and repression for 200 years.